April 29, 2010—The U.S. Consumer Product Safety Commission (CPSC) is announcing the recall of all Simplicity full-size cribs with tubular metal mattress-support frames. This recall includes fixed-side and drop-side cribs. These cribs pose a risk of serious injury or death due to entrapment, strangulation, suffocation and fall hazards to infants and toddlers. The crib’s tubular metal mattress-support frame can bend or detach and cause part of the mattress to collapse, creating a space into which an infant or toddler can roll and become wedged, entrapped or fall out of the crib. CPSC has received a report of a one-year-old child from North Attleboro, Mass. who suffocated when he became entrapped between the crib mattress and the crib frame in April 2008. CPSC is aware of 13 additional incidents involving the recalled cribs collapsing due to the metal mattress- support frame bending or detaching, including one child entrapment that did not result in injury, and one child who suffered minor cuts to his head when his mattress collapsed and he fell out of the crib. CPSC staff urges parents and caregivers to stop using these cribs immediately and find an alternative, safe sleeping environment for their baby. Do not attempt to fix these cribs. Some model numbers are followed by letters, indicating the color or finish of the crib. The name “Simplicity Inc.” or “Simplicity for Children” appears on a label on the crib’s mattress-support frame and/or the crib’s end panels. The cribs were manufactured in China. 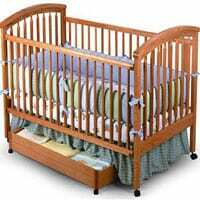 The recalled cribs were sold at Walmart, Target, Babies R Us and other stores nationwide for between $150 and $300. Consumers should contact the store where the crib was purchased to receive a refund, replacement crib or store credit. CPSC would like to remind parents not to use any crib with missing, broken or loose parts. Make sure to tighten hardware from time to time to keep the crib sturdy. When using a drop-side crib, parents should check to make sure the drop side or any other moving part operates smoothly. Always check all sides and corners of the crib for disengagement. Any disengagement can create a gap, which could fatally entrap a child. In addition, do not try to repair any side of the crib with tape, wire, rope or by other means. Infants and toddlers have died in cribs with makeshift repairs. For more information on Crib Safety, visit CPSC’s Crib Information Center.